Let’s face it. Columbus has some pretty dope places to eat! One of the most common questions I get asked is where people should eat when they come visit our fine city of Columbus. Instead of having to rack my brain every time to remember this list, I’ve decided to document all my go-to spots in one living breathing document that I can continue to update as the city and my tastes change. I’ve lived in Columbus for over ten years now so I’ve seen plenty of places come and go. It’s been really exciting to watch the local food movement blossom in our small but mighty midwestern city. 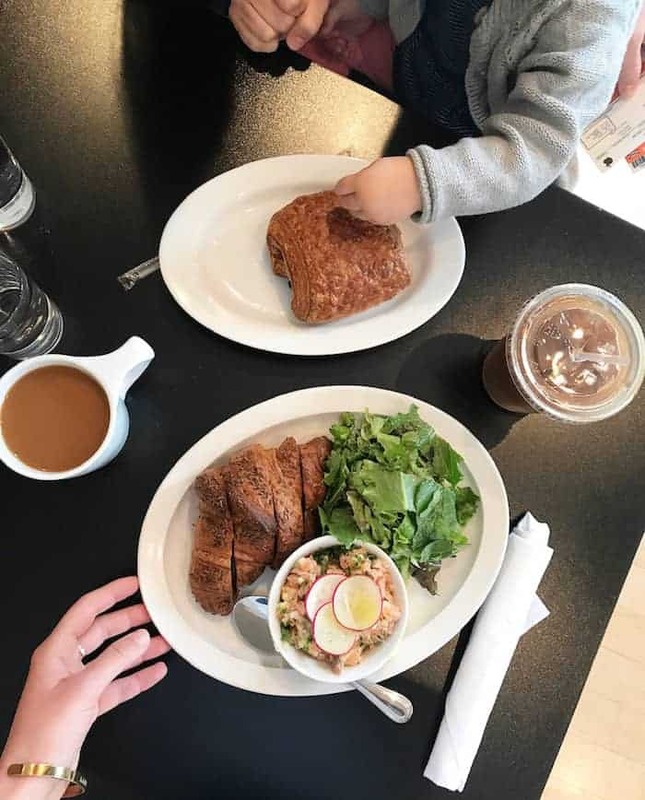 This comprehensive list of (in my humble opinion) the best restaurants in Columbus ranges from cozy coffee shops, brunch nooks, fine dining experiences, fast casual lunch digs, and funky breweries. If you have any favorites to add to this list, please leave a comment letting me know! I’m always down to try new grub. Alchemy: Shameless plug. We serve breakfast, lunch, brunch (Grandview only) and dinner, but my favorite is our Grandview location’s weekend brunch. Other menu favorites include the Cherry Cheezecake, Pesto Avocado Toast, Beet Rueben, Power Stir Fry, Curried Chickpea, and so much more. Pistacia Vera: One of my favorite coffee shops in the city with great breakfast, too. 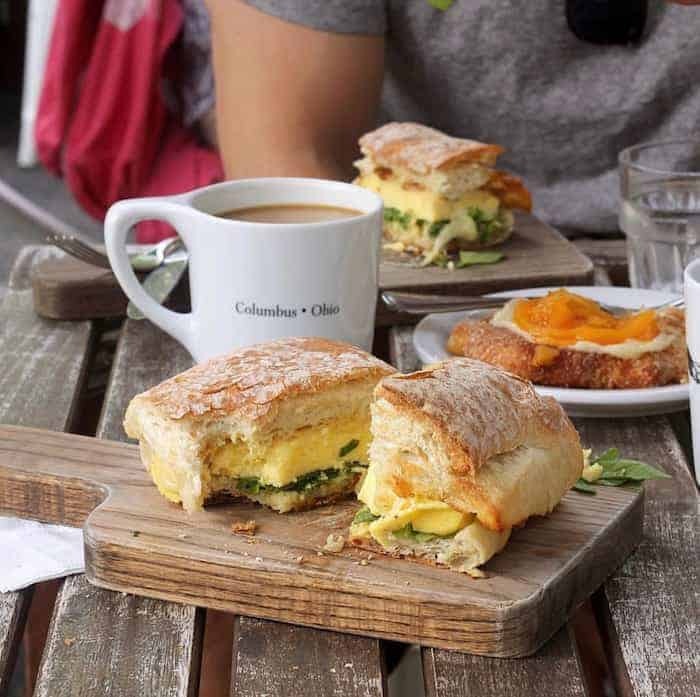 The mushroom quiche, smoked salmon croissant, and the pan au chocolate are my go-to’s. I also love their beautiful macarons! Katalina’s: A funky breakfast nook with the best Nutella pancake balls in the businesses. Fox in the Snow: The most hipster and Instagramable coffee shop in Cbus. They have the most delightful pastries (the blueberry galette and sticky bun are my favorites) and an epic egg sandwich. 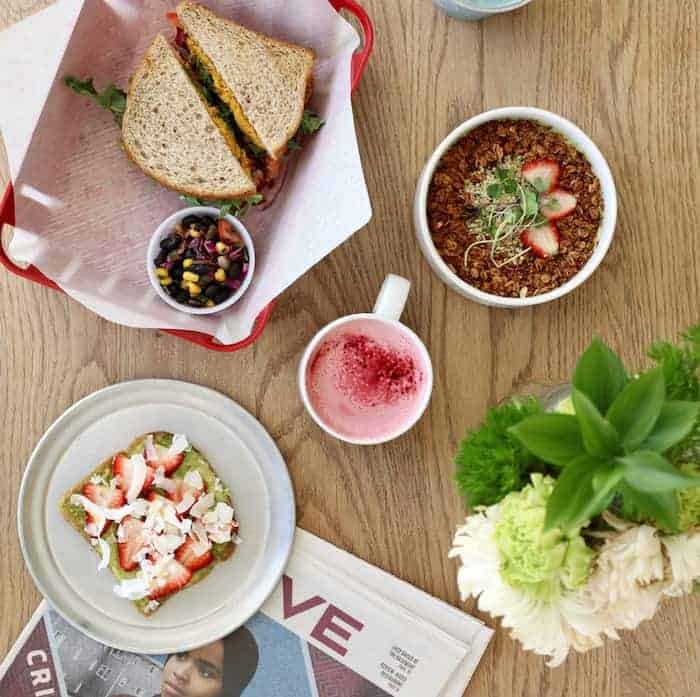 Northstar: Consistently tasty counter-service café with incredible brunch, salads, sandwiches, pizzas, and more. Everything is impeccably sourced and predominantly organic. Perfect for a quick bite! The ricotta pancakes and the veggie burger are heaven and the chocolate truffle cookie may be my favorite dessert in town. 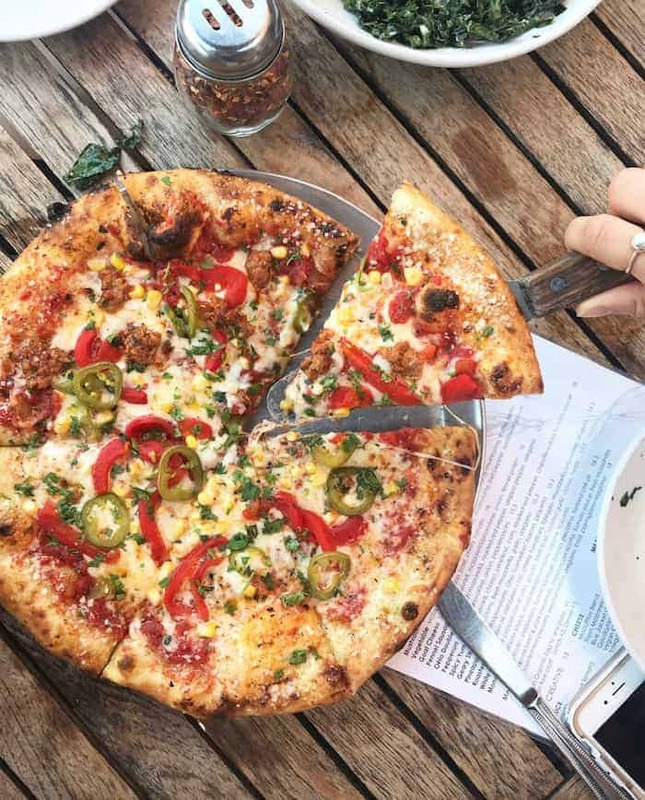 Harvest Pizzeria: Our favorite pizza, hands down. The Spicy Yuma (I get no sausage) is incredible as is the Kale Caesar. The Bexley and Clintonville locations have expanded food menus beyond pizza but I think the German Village one has the best atmosphere. I also love Natalie’s Coal-Fired Pizza and bonus points for the live jazz. My favorite late night pizza is Mikey’s, unicorn sauce not optional. Brassica: Northstar’s little sister concept, Brassica is fast-casual Mediterranean food. Don’t skip the luscious homemade whole wheat pita bread! FUSIAN: Build your own sushi roll. Great fast casual sushi on-the-go. Antiques on High: An awesome new brewery (not a restaurant) with a super cool atmosphere. It’s a sister brewery to Seventh Son, which is my other favorite local brewery. Both are great spots to grab drinks. The Crest: My favorite casual spot to grab a sandwich or beer in an eclectic gastropub atmosphere. Great patio, too. The Clintonville location is my favorite. Fun fact: I was a server there in grad school! Cosecha: Owned by the same restaurant group as Harvest, Cosecha has amazing Mexican food. The octopus small plate is one of my favorite dishes in Columbus. They also have fabulous tacos and margaritas. Don’t skip the chips and guac with avocado tomatillo salsa! It gets really busy, so I recommend calling ahead or making a reservation. New India: Straight up strip mall Indian food but SO GOOD. My favorites are Chana Masala, Chana Saag, Nav Ratan Shashi Korma, all the chutneys, and naan obviously. I’ve also heard great things about Amul India. Akai Hana: Columbus doesn’t have enough good sushi spots, but this is our fave. It’s the most authentic Japanese food in the city. You’ll definitely have to wait! Don’t forget to check out Tensuke Market. Mazah: My favorite local Mediterranean spot located right by Alchemy Grandview. Baba ghanoush, falafel…you know what to do! We also love Lavash. The Market: Chef Tyler Minnis is one of the best, most innovative chefs in the city. Go for dinner and enjoy their inventive Italian-Mediterranean bistro fare. They also have amazing brunch, like the waffle below. La Tavola: Don’t be fooled by the fact that it’s next to a laundry mat. This local spot has the best ever homemade Italian food and it’s all sourced with integrity. They have amazing rotating specials, but I can never stray from the gnocchi with marinara and the pizza. Jeff adores their chicken parmesan. Amazing salads and wine too. It’s small, so try to make a reservation ahead of time. Giuseppe’s is another delish, classic Italian spot in Bexley. Basi: Our favorite intimate dinner spot, hands down. The patio is insanely amazing and the food shocks me every time with how unique it is. We often celebrate our birthdays at Basi—it’s that good. Service Bar: A newer favorite distillery of ours for a night out on the town, Service Bar is a hip spot in Short North with amazing cocktails and spunky, innovative dishes. The pimiento cheese dip with tapioco poofs, vegetable dumplings, and Oaxacna 75 cocktail are my go-to’s. You will likely need a reservation a couple weeks in advance to get in. Third & Hollywood: This Grandview staple is a more upscale version of sister restaurant Northstar. The cheddar skillet biscuits will change your life. Calling all locals! 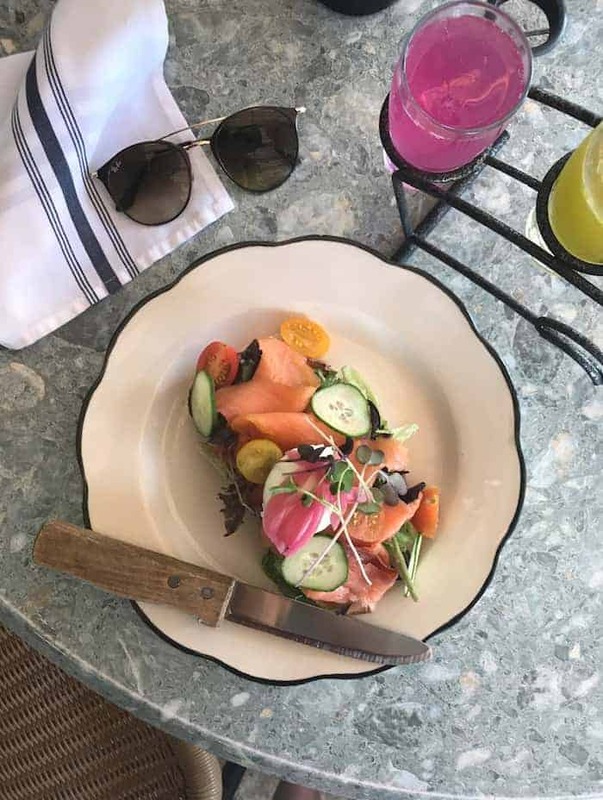 Tell me—what are your favorite Columbus restaurants? Awww thanks lovely! Come back again soon!! LOVE fox and snow cafe :) I’m a big fan of Sweet Carrot for something more casual if I have a taste for BBQ. I recommend! These are all some of my favorites! Also love Krema Nut, Whitney House, & South Village Grill! We had a really good meal at South Village Grill, I need to go back! Such good ones! I added the Giuseppe’s suggestion because we had a great meal there last year :) And YES to Jeni’s, always! I love all these places as well! 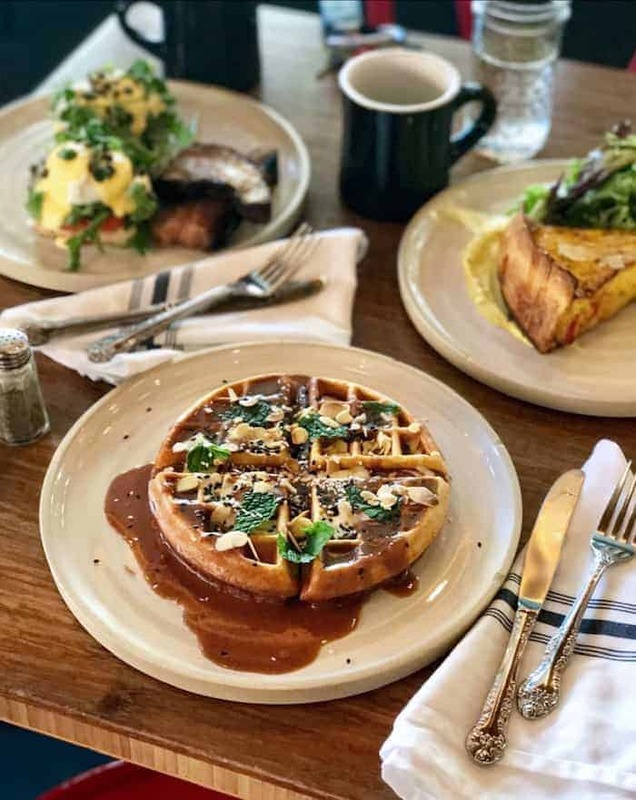 I would add Wolf’s Ridge for fine dining and brunch and their taproom for my favorite local beer and gastropub food, as well as Kolache Republic for a quick breakfast/lunch spot. Kolache is right by me but I’ve never been! What are your favorites? Another AMAZING breakfast/lunch spot is South of Lane! Yes such a cute spot. Haven’t been there in years! Other good spots: Wolf’s Ridge, RockMill Tavern, North Market, The Rossi, & Comune (+ a million more I’m probably not thinking of right now…)! Second the recommendation of La Tavola. Probs my overall favorite. In Cbus. Starliner Diner in Hilliard for brunch. Mi Li Cafe and Buckeye Pho for Vietnamese. And don’t forget Momo Ghar in the Saraga International market on Morse Road (get the #1 with a side of bread). I’m not a big steakhouse guys but I recently had an outstanding meal at The Avenue. I was so happy when we finally discovered La Tavola. Momo Ghar is so great–good addition! Second so many of those! Harvest is one of my favs, and we had the rehearsal dinner for our wedding at The Crest! Acre Farm to Table is good, and they have a sweet corn cookie that is my favorite cookie ever. For delicious authentic Mexican, Cuco’s on Henderson Rd is awesome. Yes I’ve heard their corn cookie is really awesome! Comune is a must as well! I’ve been there a couple times; the bread and spread and the pasta dish are SO good!